The Texas Hill Country communities with the most holiday spirit number 10 towns, each of which wraps its downtown area and important landmarks in Christmas lights and decorations during the holiday season. Drive along from town to town and you will see that the downtowns and neighborhoods offer dazzling light displays. Many of these towns also have unique festivities going on, including carriage rides, carolers, and Nativity scenes. Holiday-themed events typically occur on weekends during December. You can visit the Hill Country towns traveling north starting from the city of San Antonio, which has its own unique lighting displays. Although these towns are close together geographically the events are not something you can take in on a single night. Rather, visitors should expect to spend several nights in the Hill Country if they want to see a good selection of what the towns have to offer for the season. While a formal regional holiday trail no longer is publicized, you can drive from town to town yourself during the holidays discovering each unique celebration. It’s a great way to get to know the Texas Hill Country towns and to experience the lights and cheer of the holiday season. Boerne: The Weihnachts Parade is a long-standing Boerne Christmas tradition with almost 100 lighted entries traveling down Main Street. The parade is always on the first Saturday of December (with Sunday as a backup date if the weather is bad). The parade starts at 6 p.m. Boerne is also a fantastic place to shop with quaint stores and boutiques lining its main street. Burnet: Burnet turns into Bethlehem for the Christmas season. You can walk through the gates and enjoy costumed townspeople tending to their animals, making bread, and participating in a live Nativity scene. The 2018 dates are December 7, 8, 9 and 14, 15, and 16. The Nativity village is open 6:00 – 9:00 p.m. each evening. Entry is free. Dripping Springs: Shops, live entertainment, and Santa are the main attractions at this "Christmas on Mercer" celebration with extended hours at the stores. The sights and sounds of Dripping Springs’ Mercer Street event will come alive on Saturday, December 1, 2018, from 10 a.m. to 5 p.m. The downtown area becomes a Christmas festival featuring shopping, craft booths, live entertainment, a petting zoo, pony rides, train rides and more. Santa Claus will arrive at 10 a.m. The annual Lighting of the Tree will be held at the Triangle (also known as Veterans Memorial Park at E. Mercer Street, Ranch Road 12, and Hwy 290) at 6:15 p.m.
Fredericksburg: Mix an Old World German Christmas with warm Texas hospitality, and what you get is Christmastime in Fredericksburg, a month-long celebration of the holiday season. Stroll their beautiful light-filled Marktplatz with its hand-carved, 26-foot tall, wooden Christmas pyramid, or schedule your visit for events like the annual Tannenbaum Ball. It's a great place to shop with gaily decorated shops and galleries filled with one-of-a-kind treasures. There's even an ice-skating rink. Goldwaite: The Parade of Lights will be held on Saturday, December 1, 2018, in downtown Goldthwaite and will begin as soon as it is dark enough outside (usually a little after 6 p.m.). This years theme will be " A Cammo Christmas." You can have your photo taken with Santa before the parade at the Welcome Center and stop in after the parade for a cup of hot chocolate. Johnson City: Over 100,00 lights are draped on Johnson City's Blanco County Courthouse from late November through December. On the opening night (Friday after Thanksgiving) the courthouse comes aglow and the surrounding trees are lit with red lights, producing a magnificent spectacle. There are living Nativity scenes, arts and crafts booths and food vendors, and special events during the season of lights. Horse-drawn carriages, with their own holiday lighting, provide a romantic way to see all the sights up close. There's also a lamplight tour of the LBJ Boyhood Home and other historic events that are perfect for history buffs. 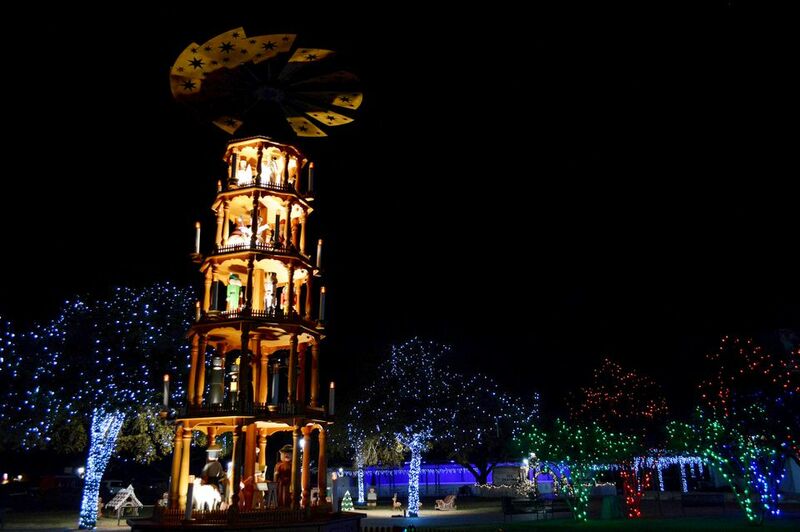 Llano: The Lighted Christmas Park will be open every night 6 - 9 p.m. You can walk the route, sipping hot chocolate, along the Llano River enjoying all of the displays that light up Badu Park. Santa Claus will be in the park every Friday and Saturday evening from 6 - 8 p.m. starting November 23 until December 22, 2018. On New Year's Eve, the park and lights are available until 9 p.m.
Marble Falls: The Marble Falls Walkway of Lights is one of the biggest holiday events in the Highland Lakes area every year. Two million lights on more than 130 sculptures illuminate Lakeside Park each year from mid-November through New Year's Day. The Walkway of Lights in Marble Falls runs 6-10 p.m. each day until January 1, 2018. The town also hosts an annual Light-Up Parade beginning 6 p.m. on Friday, Nov. 16, 2018. The parade runs south on Main Street and ends with the opening of the Walkway of Lights. After viewing the Marble Falls lights you can find more Christmas light displays throughout the Highland Lakes. New Braunfels: At Santa’s Ranch you can take a drive through over a mile of twinkling lights and animated displays. Stay warm with homemade cocoa and freshly made kettle corn. The magical displays open each night at 6 p.m. from November 2nd through December 30, 2018. You can purchase a season pass for $56 plus tax or have a one night show for $28 plus tax per vehicle. Wimberley: From November 24 to December 28, 2018, the gardens at the EmilyAnn Theater are beautifully lighted. You can visit from 6:00-9:00 p.m. (Sunday-Thursday); 6:00-10:00 p.m. (Friday & Saturday). Admission is free but donations are important as this is a fundraiser. There is a store at the entrance where you can purchase light-up toys and accessories at reasonable prices. The Rotary Club also has a children's book tent with free books. The concession stand offers hot dogs, Frito pies, nachos, and beverages including hot cocoa. It gets crowded so recommended parking is at the high school. Fredericksburg earned a spot in Country Living's compilation of “America’s 23 Best Small Towns for Christmas.” Fredericksburg, settled by German immigrants, continues an annual German-themed holiday. The magazine chose Fredericksburg for authenticity with its Christkindlesmarkt which takes place in November, commencing a holiday season of tree lightings, parades, choir events, as well as festive performances of the Nutcracker ballet. At Round Rock, each year there is a holiday model train exhibit at ArtSpace on Main Street. This year the event runs from Friday, November 23, 2018, through Saturday, December 29, 2018. The exhibit is open from 12 noon to 5 p.m.
Hill Country events during the holidays include concerts, special dining events, and photo ops with Santa. The Hill Country with its rolling hills dotted with ranches is a special place to enjoy the holidays.